Bookstein Projects is pleased to announce an exhibition of work on paper by Kikuo Saito. This is the artist’s first solo show with Bookstein Projects. Kikuo Saito (b. 1939, Tokyo, Japan – d. 2016, New York) was born in Tokyo and moved to New York City in 1966. He studied at the Art Students League and worked as a studio assistant to many preeminent artists including Larry Poons, Kenneth Noland and Helen Frankenthaler. He also worked as a set designer and has worked with such theater luminaries as Jerome Robbins, Peter Brook and Robert Wilson. Before he began to concentrate primarily on painting, Saito was also known for his own poetic theater pieces which incorporated wordless drama, costumes, light, music and dance. 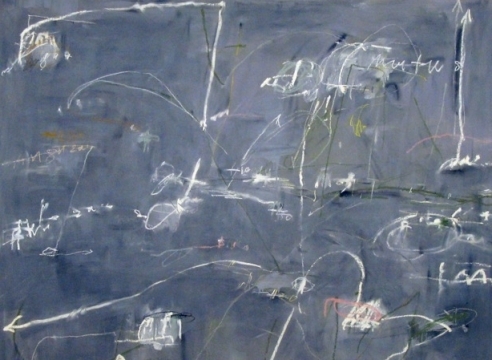 Saito has been exhibiting his paintings since 1976 in many group and solo shows. He was an artist-in-residence at Duke University in 1996 and a visiting professor at Musashino Art University in Tokyo, Japan. He taught painting at the Art Students League starting in 2005. His work is held in numerous public collections including The Aldrich Museum, Ridgefield, CT; The Museum of Modern Art, New York; and the John and Mable Ringling Museum of Art, Sarasota, FL among others. Kikuo Saito: Works on Paper will be on view from November 1 – December 22, 2018. A reception will be held on Thursday, November 1st from 6:00-8:00pm. Gallery hours are Tuesday through Saturday, 11:00 am to 6:00 pm. For additional information and/or visual materials, please contact the gallery at (212) 750-0949 or by email at info@booksteinprojects.com. Wilkin, Karen. “Kikuo Saito: Works on Paper,” Kikuo Saito: Works on Paper, New York, Jill Newhouse Gallery, 2012. p. 8.